Also serving: Holly Springs , Cary, Apex, Holly, Fuquay Varina, Morrisville, NC Contact Us for a FREE QUOTE. 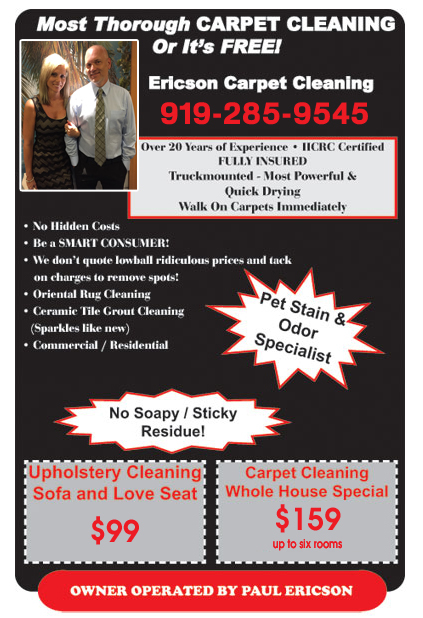 Ericson Carpet Cleaning (919-285-9545) is Owned and Operated by Paul Ericson for over 20 years. Ericson Carpet Cleaning is the premiere Carpet Cleaning and Furniture Cleaning service in Holly Springs NC and surrounding areas.